Far from the movie version of the engineering genius innovating in his lonely lab, Howard Robard Hughes was known as an entrepreneur who also enjoyed flying airplanes and pursuing movie starlets. With his unique style, he brought excitement to and focused public attention on the aviation field. After inheriting substantial wealth from his family's estate in 1923, Hughes embarked on a course to make his dreams of aviation come true. He became a successful businessman running several companies, including the airline TWA. He lent his expertise in the design of the Lockheed L-049 Constellation and flew the first "Connie," in TWA livery, on a record-breaking cross-country flight. Hughes and Boeing would cross paths in different ways both during and after his life. Not only would Hughes-created products such as the AH-64 Apache helicopter and spacecraft from Hughes Space and Communications eventually become part of Boeing's portfolio of products, but Hughes also would purchase a Boeing Stratoliner, the first airliner with a pressurized passenger cabin, for personal use. During his early years, Hughes garnered more fame and notoriety as a movie director and producer than as an aviation pioneer. Although he produced many movies on varying subjects, aviation was his first love. Hughes wrote and directed the World War I epic "Hell's Angels," which began filming in 1928. He assembled an array of 87 World War I aircraft and personally directed the aerial combat scenes over Mines Field (now Los Angeles International Airport). Filming for "Jet Pilot," starring John Wayne, began in 1949 and extended through 1951. Hughes continued to perfect the aerial scenes, and the film was not released until 1957. In this era before computer-generated imagery, Hughes needed real airplanes to film his scenes. Thanks to his pioneering work in aviation, the U.S. Air Force was willing to help him out. Segments included exceptional F-86 aerial scenes with pilot Chuck Yeager at the controls of one of the Sabre Jets. Moviegoers also saw footage of Northrop's XF-89 Scorpion prototype—which appeared as a Russian fighter. In the aviation world, Hughes established early speed records in a specially designed H-1 racing aircraft. Hughes was recognized as an excellent pilot, and in 1938, he was awarded the Collier Trophy for an around-the-world record flight in a Lockheed Model 14. 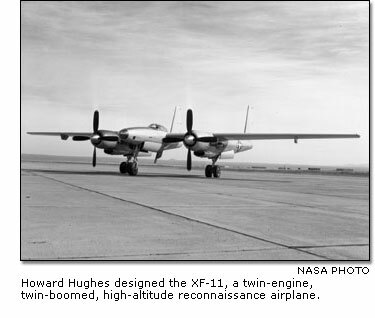 Determined to get a military airplane contract, Hughes designed the XF-11, a twin-engine, twin-boomed, high-altitude reconnaissance airplane that was reminiscent of the famed Lockheed P-38 Lightning. But during the airplane's initial flight in 1946, Hughes was almost killed in a crash when an oil leak caused the aft set of counter-rotating propellers on the starboard engine to go into reverse pitch. The No. 2 XF-11 was modified, and the counter-rotating propellers were switched out for standard, variable-pitch blades. Hughes would not, however, secure any military orders for the XF-11, as the Army Air Corps opted for the Boeing RB-50 for high-altitude long-range reconnaissance. In 1942, when German U-boats were taking a tremendous toll on U.S. World War II Liberty ships, shipbuilder Henry Kaiser conceived the idea of a large fleet of troop/cargo flying boats constructed of wood because of the wartime metal shortage. Donald Douglas turned down the project, and Kaiser enlisted Hughes. With a government contract of $18 million, the HK-1 (for Hughes-Kaiser) was underway. Development proved too slow for Kaiser, and when he pulled out, Hughes renamed the airplane the H-4 Hercules. Eventually, the world's largest flying boat was completed and moved overland from the Hughes factory in Culver City, Calif., to Long Beach (Calif.) Terminal Island. Because the airframe was mostly made of wood, it acquired the nickname "Spruce Goose." Hughes hated the name because the wood used was birch, and it belittled a masterful design and the dedication of hundreds of workers. On Nov. 2, 1947, at Long Beach Harbor, Hughes took the massive aircraft aloft for about a minute, covering one mile at an altitude of 70 feet (1.6 kilometers at 21.2 meters), proving the H-4 could fly. He never attempted to fly it again. Timing did not help the Hercules. Postwar military downsizing, combined with a military mindset that did not support using large airlift aircraft to ferry troops and equipment worldwide, doomed the project. Hughes did eventually find success with military flying machines. By 1976, the Hughes Toolco Aircraft Division was reformed as Hughes Helicopters, which competed for both commercial and military helicopter contracts. The AH-64 Apache attack helicopter, still in Boeing production today, received the Collier Trophy in 1983. Hughes Helicopters was acquired by McDonnell Douglas in 1984. Hughes' creative and inventive mind extended well beyond the Earth's atmosphere. At the age of 11, Hughes had built his own shortwave radio from scratch and taught himself Morse code. He believed that, in the future, people everywhere would be able to communicate with one another instantaneously. Although science fiction writer Arthur C. Clarke originated the concept of satellites operating in a stationary, or geosynchronous, orbit above the Earth, Hughes made it a reality. With the invention of miniature circuit chips, the size of such a spacecraft could be greatly reduced, making it feasible to launch and place communications satellites in geosynchronous orbit. In 1963, Syncom, the world's first geosynchronous communications satellite, developed and built by Hughes Space and Communications Company, was launched. Hughes also developed the first meteorological geosynchronous satellite, ATS-1, launched in 1966. Boeing purchased Hughes Space and Communications in 2000, and it became Boeing Satellite Systems. With an eye always toward the "black world" of clandestine operations, Hughes saw a unique opportunity present itself in 1970. In 1968, a Soviet Golf-II Class ballistic-missile submarine suffered a catastrophic explosion and sank in the Pacific Ocean about 750 miles (1,200 kilometers) northwest of Hawaii. The Soviets gave up searching for the sub, but the United States knew the location to within 10 square miles (26 square kilometers) and was eager to obtain Soviet nuclear and missile technology. Under the guise of creating an undersea mining vessel, Hughes Tool Company contracted with the U.S. Central Intelligence Agency in November 1970 to build the Glomar Explorer, equipped with a giant retrieval claw to attempt a recovery of the submarine. In 1974, the Glomar Explorer retrieved half of the hull containing three nuclear-armed ballistic missiles, two nuclear torpedoes and code information from a depth of some 16,000 feet (4,853 meters). Perhaps still fascinated by satellite capabilities, espionage and the Cold War, Hughes was rumored to have watched the film "Ice Station Zebra" hundreds of times during his last years. After many years as a recluse, Hughes died on April 5, 1976. With the December 2004 release of the film "The Aviator," Hughes' personal life, genius and exploits have again captured the public's attention. One of Hughes' last requests was that he be remembered for his contributions to aviation. Looking at the strides and progress made by today's aerospace industry-many based on Hughes' work—the aerospace world is honoring that request.